Pasteur Had A Good Run, But What’s Next? When the beer revival started over 30 years ago pasteurization was a big deal, or rather, the absence of it. It was noticed when the new crop of beers wasn’t pasteurized, which was often the case. Earlier, almost all bottled and canned beer in North America had been pasteurized. Coors was an exception: it used a fine filtration method that it felt removed most of the active biological matter, especially yeast. But Coors applied end-to-end refrigeration to lessen the risk of undue spoilage. A couple of other brands, usually advertising a “draft” character, similarly skipped pasteurisation but were carefully filtered; Miller Genuine Draft is a good example. Draft beer generally had not been not pasteurized because it was sold locally and within a short time frame. It was also kept cold until the beers as served. Today in Canada I am quite certain the mainstream brands are pasteurized whether bottled/canned or draft. In the U.S., you hear different things, but I’d guess the mega-brewery draft beer, except Coors and Miller Genuine Draft, is pasteurized. The same applies to old-established regionals like Yuengling. The onset of flash pasteurizing for mass market U.S. draft was encouraged as well by the Sankey keg system. It was invented in the U.K. in the 1950s and was designed to be filled in connection with flash-pasteurized beer. As for craft beer made by mega-brewers which now own those brands, practice varies. Some of those beers are now pasteurized, some are not. In Canada for example, I’ve heard that Molson Coors does not pasteurize any form of Creemore Lager. What about, though, Goose Island IPA as brewed in a Labatt plant? I’d think it is pasteurized but am not sure. 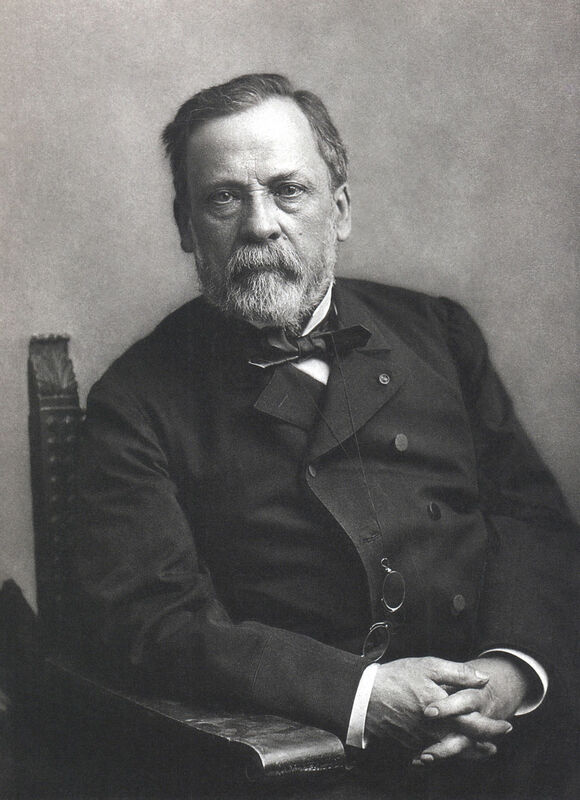 Pasteurization takes its name from the French scientist Louis Pasteur. In experiments to promote the better keeping of wine and beer, he concluded that application of relatively low levels of heat (c. 165 F) would stabilize the product and retard souring for longer. The idea wasn’t new, canned food had been treated with heat to preserve its contents by then, and centuries before the Chinese were heating wine to preserve it. But Pasteur had a huge impact on the beer industry. Early descriptions of the process refer to “steaming” the beer, or even sterilizing it although pasteurization is not sterilization technically (that would involve using a much hotter process which would destroy much of the character and taste of the beer). Pasteurization is not applied to make the beer safe for consumption: alcohol in beer ensures dangerous pathogens are absent. Rather, the process is used to retard undue spoilage, especially souring. An old, unpasteurized beer cannot harm you, in other words, it is different where the process is used in the milk and cream industry. 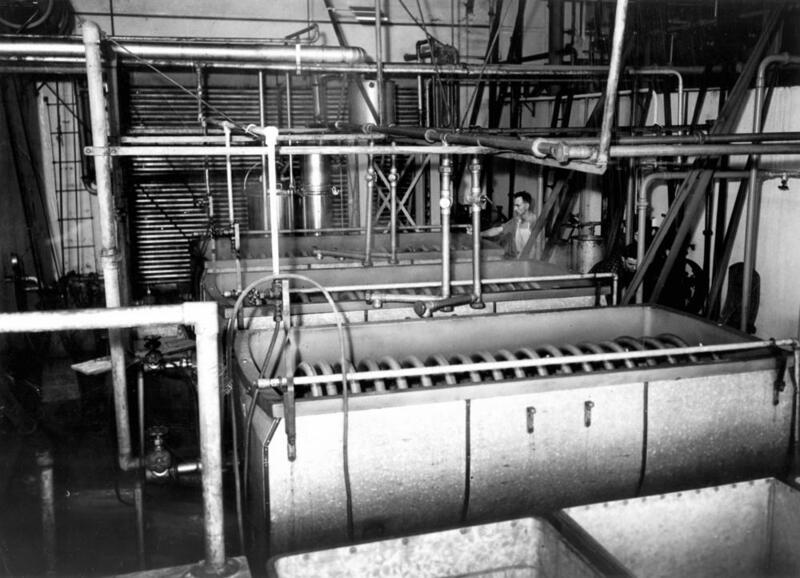 Below, I show an image from the 1930s of a pasteurizer which happens to be from the dairy industry, but the principle is very similar to that used in brewing. There are two forms of pasteurization, the tunnel method and the flash method. The former is more intensive and the bottles stay in a tunnel for 30 minutes or more and their temperature is elevated within a period calculated to secure a given period of stability. The flash method entails heating the beer to a higher temperature (some sources say lower) but for a much shorter time. This correspondingly obtains a shorter period of stability for the beer. I could give more technical details, for any interested, but this explains the nub of it. By definition, English-style cask ale is not pasteurized since it is unfiltered after coming out of primary fermentation and remains so until dispense – killing the active yeast in the beer would defeat the purpose. The lack of application of heat and retention of some residual yeast in the beer gives it a delicate edge pasteurized and filtered beer doesn’t have. Many traditional small breweries in Europe never pasteurized, even where they filtered their products clear for the market. Many connoisseurs sought out these beers for their extra character. Following this example, when the first modern craft beers emerged in North America, most were unpasteurized regardless of packaging method, and the breweries made a point of this. Either the beers were filtered to be clear or left with some residual yeast (in bottle or barrel), but pasteurization was avoided to retain the fullest flavour possible. Therefore, a beer like Sierra Nevada Pale Ale to this day is not pasteurized. Certainly the bottled beer isn’t and I believe the draft, even as exported to Canada, is not. Most craft brewing in Ontario does not pasteurize. Sleeman, now owned by Sapporo of Japan, always did, I understand, but it is an exception. In the U.S., the iconic Anchor Brewing in San Francisco has pasteurized throughout its revival, as it sought to meld the best of old and new brewing practices. The “best”, in the minds of its management in the late 60s, included pasteurization. Even its draft beer is pasteurized. Anchor uses the flash method for all packaging forms, however. I’ve read that Samuel Adams’ bottled and canned beers are pasteurized – in part this may have been because a lot of it was contracted out to industrial breweries. Its draft, at least as sold in the U.S., is not pasteurized. Some other well-known craft names do pasteurize, but information is hard to come by as this information is usually not volunteered. Some years ago, I asked Anchor Brewery why it pasteurizes everything when, i) most craft beer is not pasteurized, and ii) one can regularly drink all forms of craft beer made on the other side of North America and it seems usually just fine. The LCBO imports craft beer from British Columbia, say, and many other far-away places. Rarely can I recall buying one that was sour in the bottle without intending to be – maybe once or twice in 30 years. Are modern brewers who pasteurize being too conservative? You can read Anchor’s reply to me here. In essence, they said that despite modern brewing sanitation methods being used (to avoid wild yeast and other sources of contamination entering the packaged beer), pasteurizing is an insurance policy to lengthen shelf life. They acknowledged that some people feel taste is affected by the process, but offered the opinion, as many brewers I’ve met do, that people cannot tell the difference when tasting blind. All brewers seem to agree that pasteurization must be done “correctly”, and e.g., if beer is heated too high, it may lead to a burned caramel taste (which I sometimes taste in all kinds of pasteurized beer) or even premature oxidation – damp paper staling. This can result from the effect of the heat on residual oxygen in the beer. (I have encountered this problem too). While I have never done a blind test – happy to participate if anyone asks – I am convinced that pasteurization does alter flavour somewhat. Some brewers feel the same, and e.g., the advertising for the “tank” version of Pilsner Urquell you can get in some specialist bars in Europe specifically claims a superior flavour due to absence of pasteurization. Look at this explanation, in regard to such a pub in Ireland. That explanation states that unpasteurized Pilsner Urquell is good for only three weeks and once tapped should be used up within a week. How does that square with being able to drink perfectly sound craft beers made thousands of miles away which have to be older than three weeks from packaging, in some cases much older? I think again brewers are being conservative. Also, Urquell is 4.4% abv, rather weaker than most craft beer. Higher alcohol probably preserves beer for longer. The other explanation many brewers give is, craft beers often have high levels of hopping or other flavour attributes which disguise any faults resulting from absence of pasteurization. I’m not sure I agree with that, or not entirely. Yesterday, I discussed the Heineken BrewLock draft dispense system, an improvement in the eyes of its producer on the current method to dispense draft beer. However one views that, one thing the process doesn’t change is pasteurization – BrewLock Heineken is pasteurized as all forms of Heineken lager are, even for The Netherlands market. A real innovation, and I predict it is the next frontier, is introducing commercial draft beer which is not pasteurized, in particular for well-regarded imports. Doing so will take a leaf from the book of the craft brewers, most of whom do not pasteurize. Tank beer is the wedge – and it is not just Pilsner Urquell which is available in some places in that form, other Czech beers are also including Staropramen and Budvar. IMO, there is no reason today that beer can’t reach our market from Europe or almost anywhere within four weeks. Some bottled/canned beer already gets here, even in the LCBO’s system, within six to eight weeks from packaging. Modern transportation and logistics systems should be able to accommodate fast transport of unpasteurized beer including in refrigerated form if necessary. Certainly a brewer who does this first will have a leg up because I believe unpasteurized beer is superior if drunk within a reasonable time from packaging. The timeline may vary with the type of beer being made, but experience with a wide range of craft beer shows that it is perfectly drinkable for much longer than four weeks. Finally, just because the flavour difference may be subtle in many cases, and the average customer can’t articulate why he/she prefers one form to another, doesn’t mean an unpasteurized beer won’t appeal more than one which is not. It will. Note re images above: Both are in the public domain, and believed available for educational and historical purposes. They were sourced here and here. All feedback welcomed.